With warm weather upon us, this time of year is my favorite. Barbecuing is a staple at our house and I love testing out new recipes on the grill. Every time we visit Sam’s Club we make a point to walk down the spice and rub aisle searching for new flavors. I recently discovered KC Masterpiece® BBQ Sauce Mix & Dry Rub and knew I had to give it a try. It comes in several flavors but you can also customize it to suit your meal. You can use the KC Masterpiece® BBQ Sauce Mix & Dry Rub as a BBQ sauce, a dry rub or even a marinade. Depending on if/what you want to add to the rub it goes great on chicken, pork, beef, and veggies. The back of the package gives great ideas on ways to customize; including adding your favorite drinks; Simply Lemonade®, Coca-Cola® or Gold Peak® Tea. 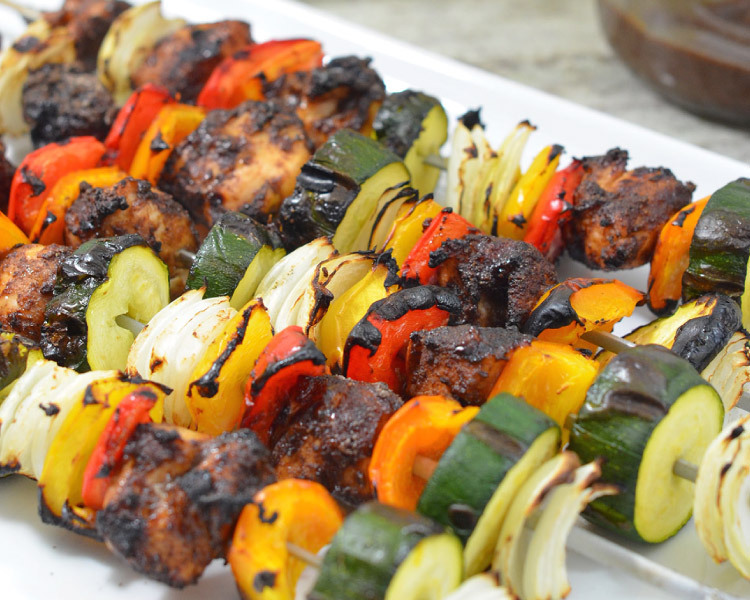 So if you haven’t already gotten your grill out for the summer, then you’ll want to so you can test out these delicious Grilled Chicken Kabobs. To get started you’ll need to get your ingredients. I decided to test out the KC Masterpiece® BBQ Sauce Mix & Dry Rub by using the dry rub as is on the chicken. 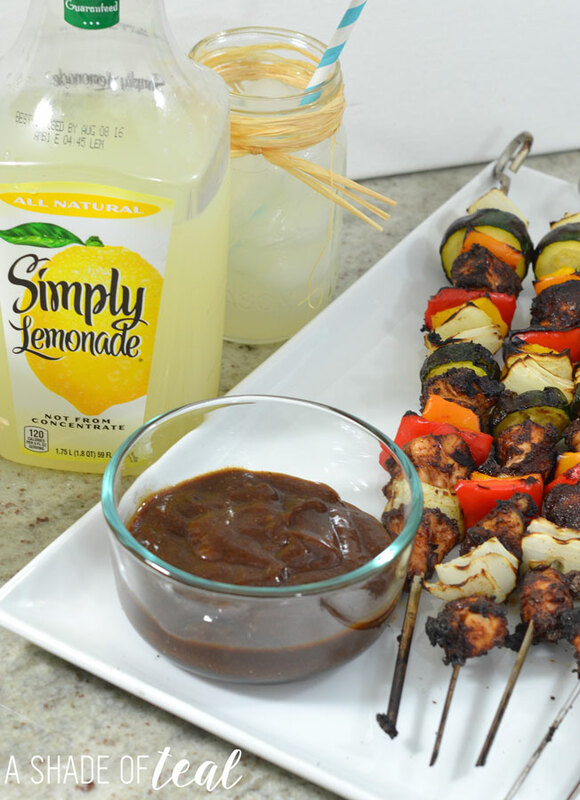 I then made some additional BBQ sauce with Simply Lemonade® to serve with the kabobs. 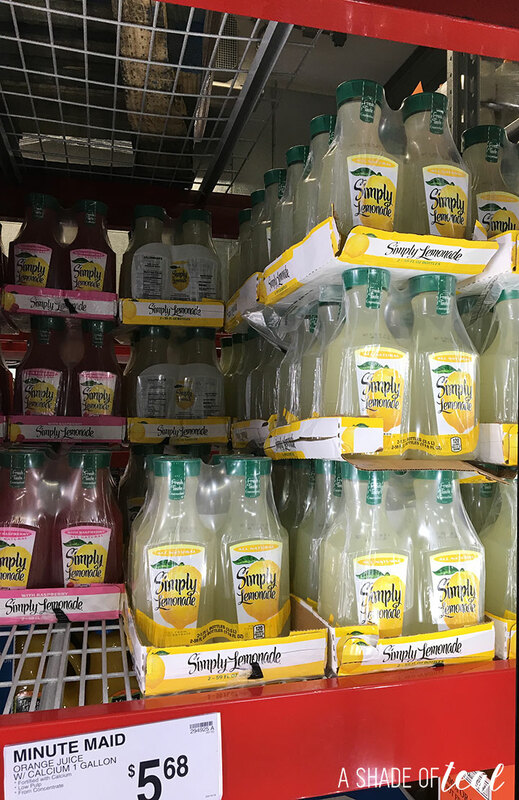 You can find Simply Lemonade® at any Sam’s Club in the refrigerated section. We pretty much always have Simply Lemonade® on hand since out daughter loves it and I love the fact that it’s all-natural lemonade with no added preservatives, colors, or artificial flavors. I also love shopping at Sam’s Club since I can pick up all my Summer essentials for entertaining. Ready to make it? Grab your ingredients and start prepping. I first made the BBQ sauce since the package suggests to let it sit in the fridge for 1 hour. To make the BBQ sauce simply empty 1 packet of the KC Masterpiece® BBQ Sauce Mix & Dry Rub in a bowl. 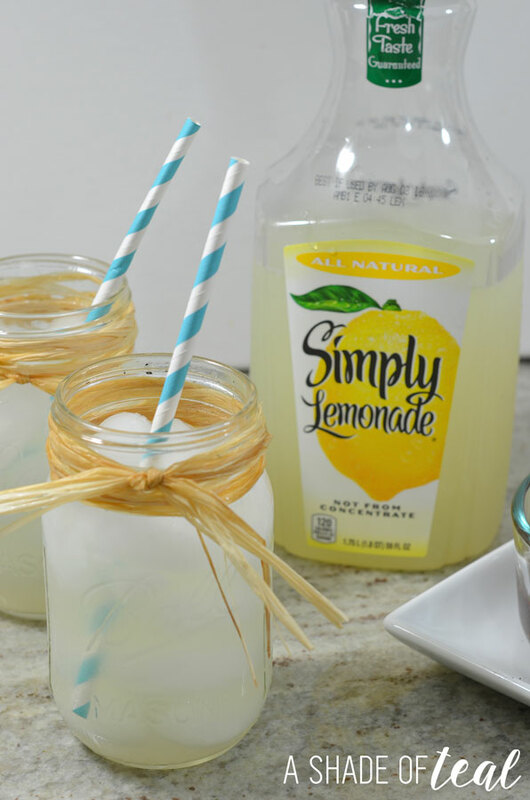 Then add 3/4 cup of Simply Lemonade® or the liquid of your choice. Make sure to mix really well and then place in the fridge. 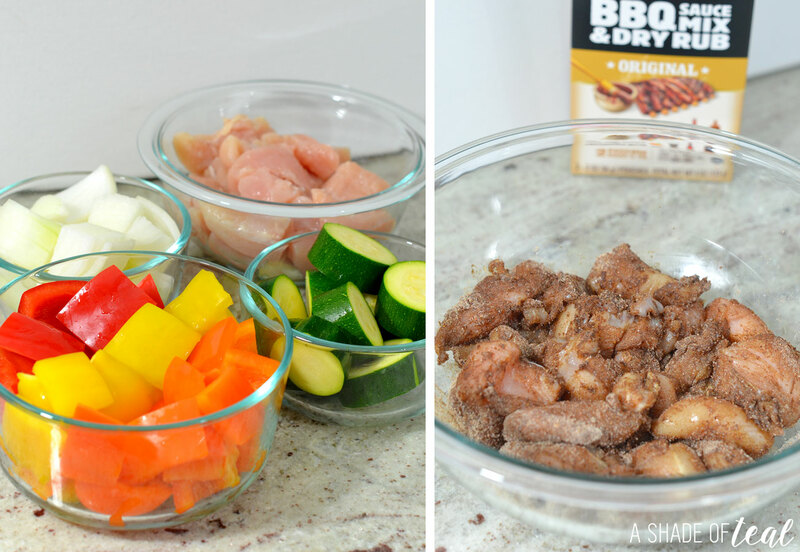 For the kabobs you’ll want to start by chopping up all the veggies and the chicken into large chunks. Then add 1 packet of the KC Masterpiece® BBQ Sauce Mix & Dry Rub to the chicken and make sure all the chicken is evenly coated. Next, thread the ingredients onto skewer kabob sticks. I like to alternate the items on the skewers. I also recommend purchasing metal skewer sticks since you don’t have to worry about soaking them before grilling. Heat the grill to medium-high heat. Then cook over medium-high heat, turning the kabobs every couple minutes. Grill for about 15-20 minutes or until the chicken is fully cooked. 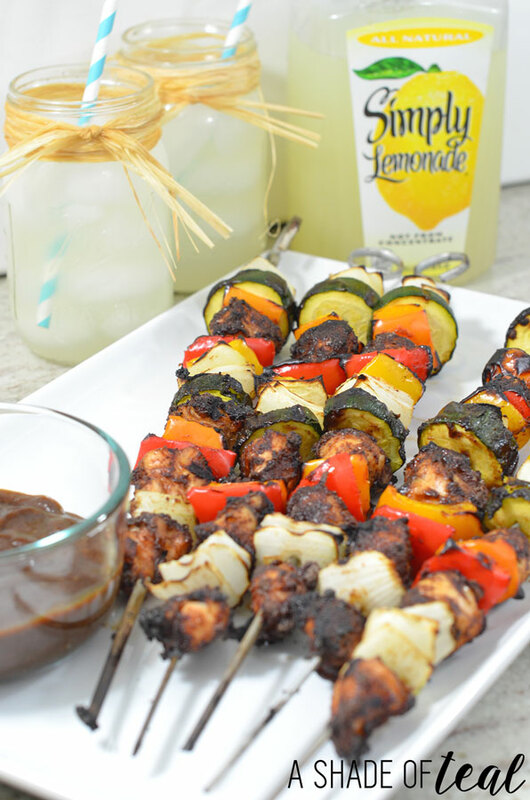 Remove from the grill and serve immediately with your BBQ sauce and some delicious Simply Lemonade®. 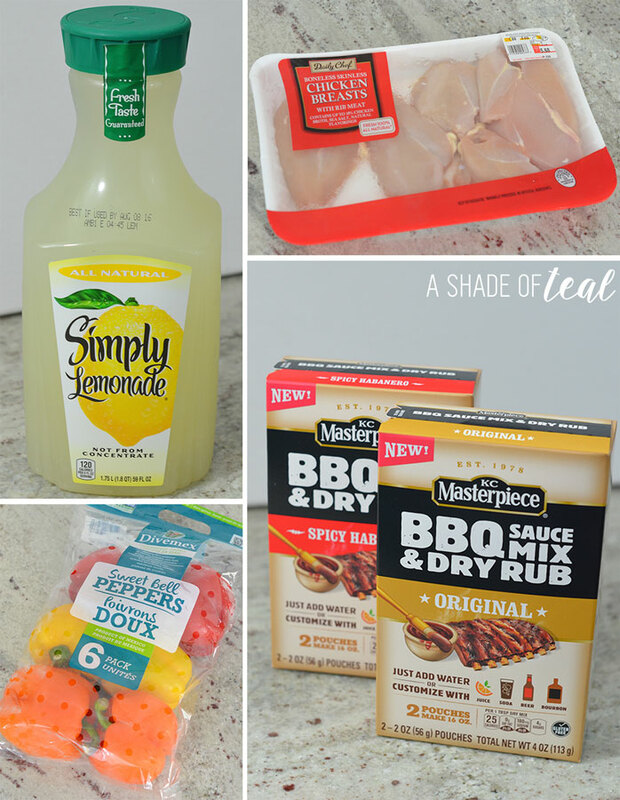 I absolutely loved the flavor of everything; from the dry rub on the chicken to the BBQ sauce made with the lemonade. You can really taste the sweetness of the lemonade in the sauce. Next time I plan to add some spice to the BBQ sauce; the possibilities are endless with the KC Masterpiece® BBQ Sauce Mix & Dry Rub. 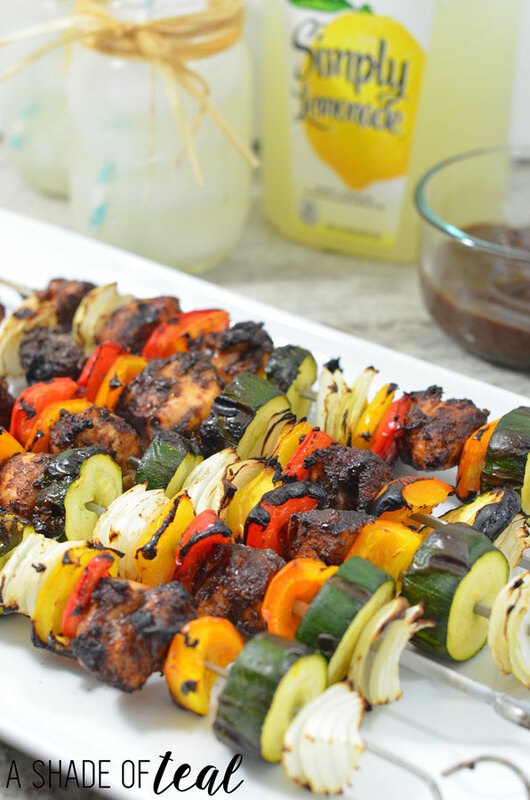 Delicious Grilled Chicken Kabobs made with Simply Lemonade® & KC Masterpiece® BBQ sauce. Mix well and then place in the fridge. Chop all the veggies and the chicken into large chunks. Add 1 packet of the KC Masterpiece® BBQ Sauce Mix & Dry Rub to the chicken. 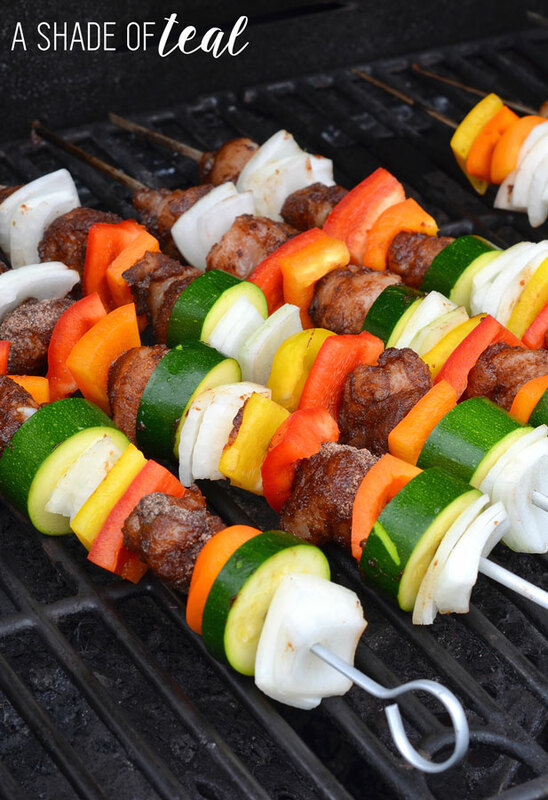 Skew the ingredients onto skewers. Grill for about 15-20 minutes or until the chicken is fully cooked. Are you ready for grilling season? Do you have a favorite recipe you make every year? 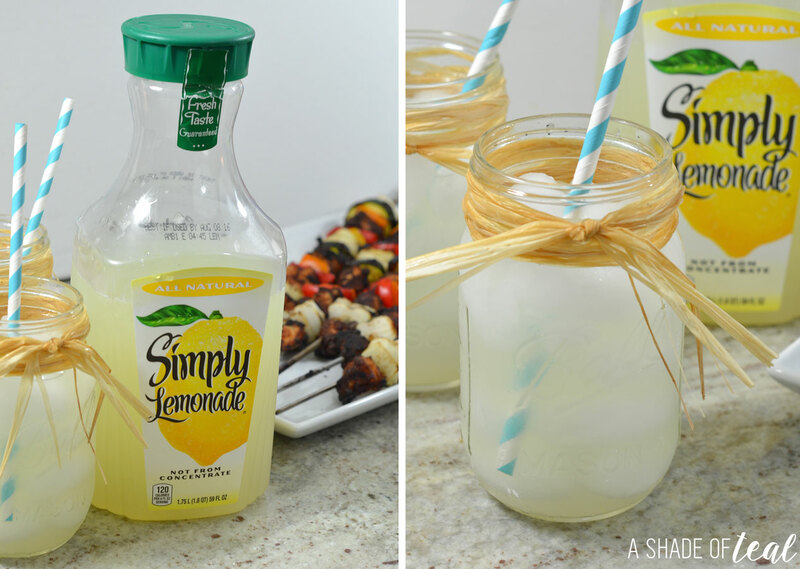 Make sure to check out these Simply Lemonade® & KC Masterpiece products at Sam’s Club! I love Simply Lemonade. I would’ve never thought to use it to mix with a bbq sauce. The kebabs look so tasty! Thanks for sharing this idea! Oh yumm!!! 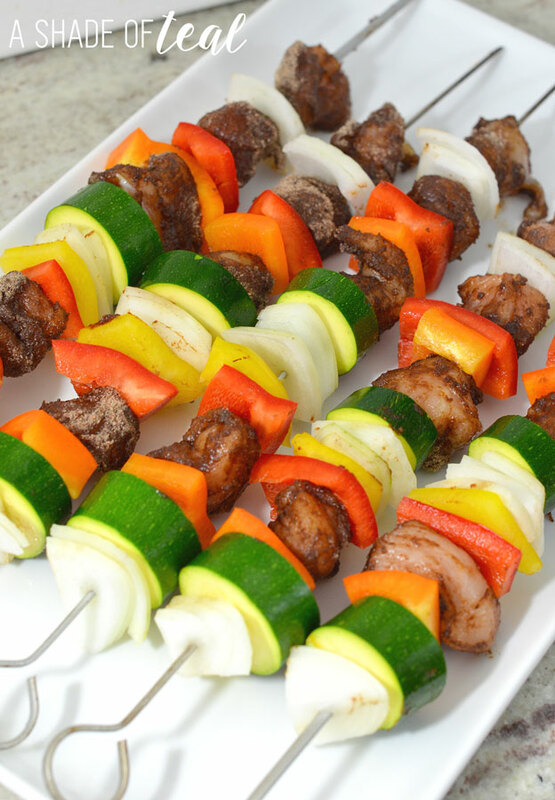 I love kebabs and these ones look absolutely delicious!!! 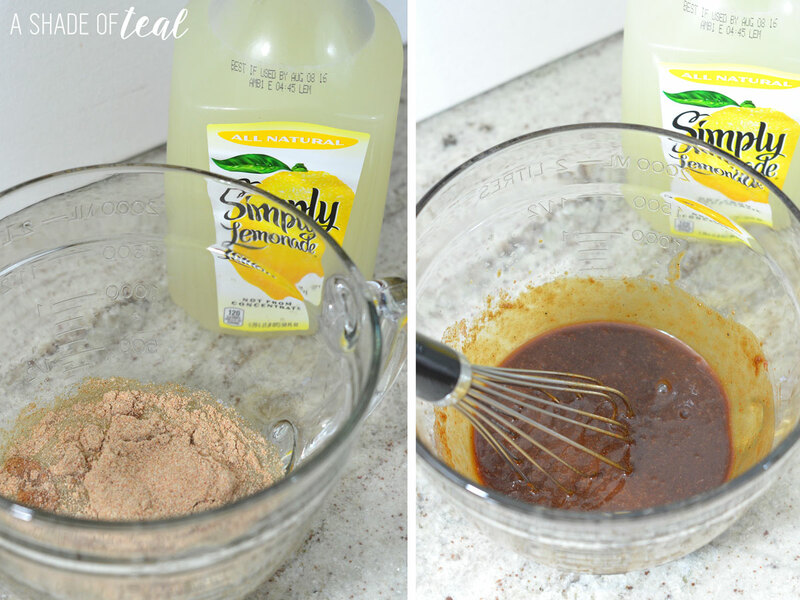 I love sweet BBQ sauce so the mix with lemonade would be perfect for me! Can’t wait to try it out!